When it comes to the functional part of your home, a kitchen is more than just a stunning backsplash and gorgeous cabinets. There is no arguing with the fact that remodeling your kitchen isn’t a cakewalk. 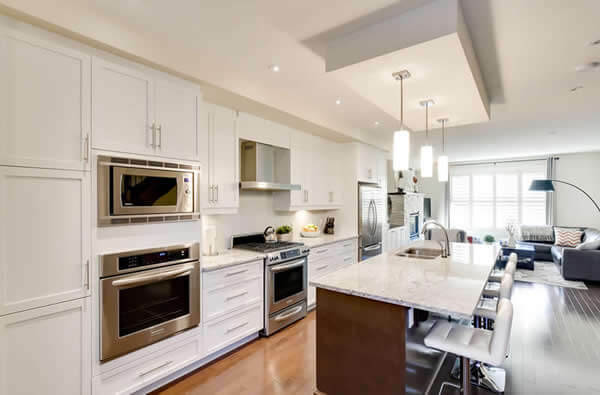 However, if you are looking to remodel your kitchen, it is important for you to integrate these thoughtful tips that are functional and easy to work. Let’s talk about them in detail. 1. Eliminate Wasted Steps: Think about how and where you use kitchen items. It is important for you to store breakfast foods and bowls near the breakfast table. Try keeping wraps and plastic containers in one handy spot near a work surface for wrapping leftovers. In order to ease the process of unloading, it is important for you to locate dishware and flatware near the dishwasher. 2. Find the Right Height For Your Microwave: The best height and location for a microwave oven depends on the kid-friendliness desired in the kitchen. Talking about adults, around 13-15 inches above countertop level is an ideal height that you must consider. While for children, a below-countertop setup will work best. 3. Consider the Countertops: Those who cook more often require more counter space than those who cook infrequently or who prepare day to day meals. Incorporating two countertop heights makes baking easy and helps kids who are involved in the preparation of dishes. 4. Be Aware When Storing Knives: One of the important tips you should keep in mind is that make sure you have a designated spot for knives. This makes it easy to spot the right knife for a job and keeps dangerous items that can be a threat to your loved ones. A knife drawer is something you should consider as it helps to hold knives in place and sheath the sharp blades. 5. Cut Cleaning Time: Always remember that careful design decisions make cleaning easy. Glass refrigerator shelves catch spills while under-mount sinks don’t have a crumb-catching rim to worry about. Try choosing matte finishes that don’t show dirt as much as glossy ones do. 6. Find a Center Point: Splashy tile, sizable range hoods, bright kitchen cabinets, and busy countertop patterns give the eye an amazing look. Hence, it is important for you to pick one focal point in your kitchen design and complement that area with appealing details. 7. Break Up Cabinetry Blocks: Last but not least, try replacing boring doors and drawers by adding interesting details such as glass doors. Or you can even try wine storage cupboards or windows.